Mix the split vanilla pods, seeds of which will have been got back, with the milk and the butter. Made infuse has very soft fire without boiling 10 minutes then reserve for the cool. Clear eggs and yellow with the sugar in the electric mixer then add the flour, well mix in the whip or the electric mixer then reserve. Pour the warm milk (without pods on the mixture of cleared eggs by whipping so that the preparation is homogeneous and rather supple). Pour the rum, mix in the whip, put back pods in the preparation, once reserve cold in the refrigerator. Use the preparation with canelés at least after 24 hours of rest, this preparation is rather stable and after three days, it is only better. For the cooking, to use moulds grooved in silicone (traditionally they are copper mould for more of crunchy) which you will grease with a spray. Well to mix in the whip your preparation grooved then pour into your moulds. Preheat your oven in 210°c, put in the oven for 45 min at least. Turn your moulds in your oven after 20min. 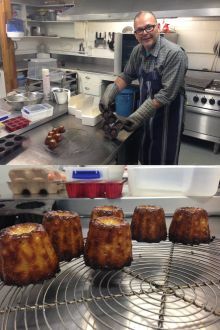 Take out the hot canelés from your oven and then straight away from their mould. Let them rest at least 30 minutes and eat them warm they are better.